Resorptive Lesions, or RL's, are a condition unique to cats. Cats get an unusual dental disease. It's not cavities. It's not periodontal disease. It is a condition which happens very rarely to dogs or people, but which is quite common in cats. We're talking about Resorptive Lesions (but we'll call them RL's for short from now on). An RL is a hole in the tooth. 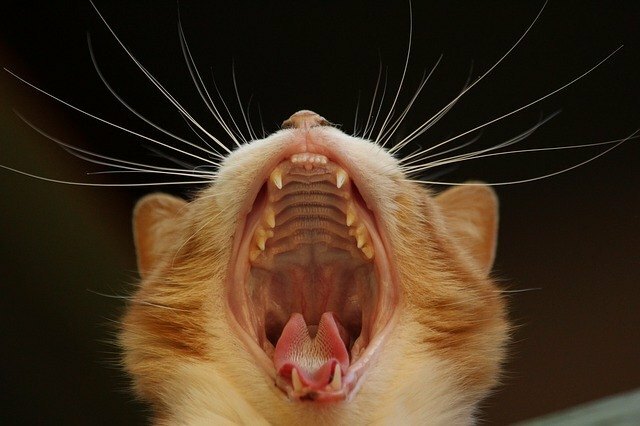 While there are some important differences between RL's in cats and the cavities we have all had, there are many similarities. A cavity is a hole in the tooth. An RL is a hole in the tooth. Cavities result in the exposure of the sensitive nerve pulp of the tooth, and in their advanced stages, cavities are very painful. RL's also result in painful pulp exposure. Cavities also lead to infected and abscessed teeth. RL's also lead to infected teeth. We all know what causes cavities. Cavities are caused by sugar, bacteria, and decay, and they happen from the outside in. We don't know what causes RL's. It is speculated that they may be caused by an out-of-control autoimmune response, calicivirus, or perhaps metabolic imbalances relating to calcium regulation, and they happen from the inside out. No matter the cause, the net effect is the same. 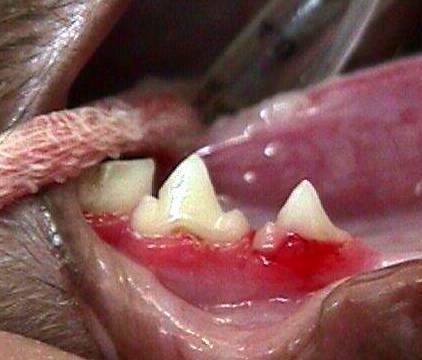 In the picture below, we see the teeth in the bottom jaw of a cat. Notice how red and inflammed the gums are. The redness is worse around the tooth on the far right. 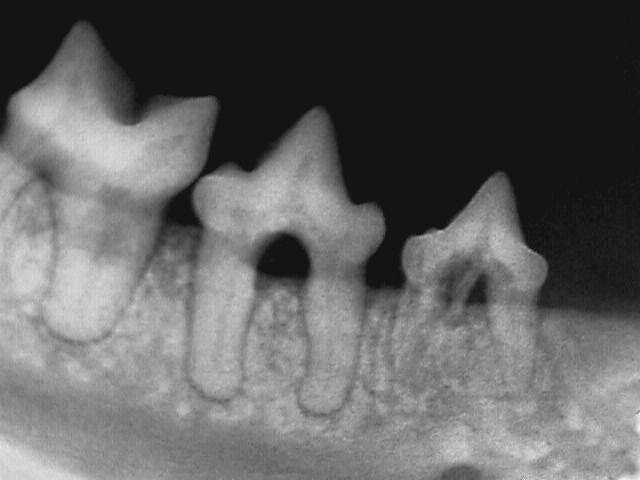 An x-ray of these same teeth is posted next. Like cavities, once there is a hole leading from the sensitive dentin to the outside, the tooth becomes very painful. How painful is it? The answer is very painful. Most cats with RL's will exhibit teeth-chattering when the RL's are touched even lightly with even a Q-tip. Your cat may not show many other signs of pain, however. This does not mean that the cat does not feel pain. 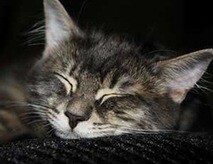 Click Here for a more detailed discussion about how to tell if your cat is in pain. The Treatment of Choice for RL's is Extraction. It does no good to put a filling in an RL. The erosive process that caused them in the first place will dissolve the tooth out from around the filling, and the filling will simply fall out. While it may seem a bit extreme to extract a tooth with an RL, just consider the alternative: Living daily with a very painful tooth. There are things to know about extracting teeth with RL's. 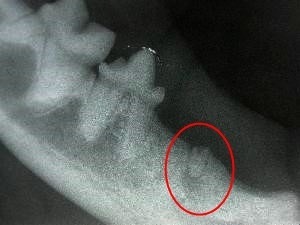 Look again at the radiograph of the cat tooth with an RL. This time observe the roots closely. You wil note that the smallest tooth has roots that seem blurry or indistinct when compared to the roots of the neighboring teeth. This is because the roots are starting to be resorbed too. This means that teeth with RL's can be very difficult to extract. The roots tend to shatter and fragment, making it difficult to get the whole root. It is in general a bad idea to leave root fragments in place because they are often infected, and retained root tips can continue to be painful. The next radiograph shows another cat with a retained root tip. It is easily visible within the red circle. There is a fairly obvious dark halo around the root tip we can easily see. This halo is caused by infection in the retained root tip. Infection trapped deep in this buried root tip is eating away the bone at the tip of the retained root, causing the dark halo. It takes a lot delicate work using the proper techniques and the right instruments to safely and completely remove RL teeth. The gums are moved out of the way, the tooth is cut carefully into pieces, some of the overlying bone is removed, and the tooth is gently removed. Then the gums are sewn back into place. Because this can be a very lengthy, delicate procedure, treating your cat's RL's can be fairly expensive. Most cats develop RL's in more than one tooth. It is quite common to have to extract many teeth at one time, If we identify one tooth with an RL in it while the cat is awake, we often fiond more RL's when the cat is asleep and we can examine them in more detail. It is also common for a cat to develop more RL's as time passes. Sometimes in a year or two we have to go back and remove more teeth that have deleloped painful lesions. Sometimes all the teeth must be removed. However, once the healing process is over, the cats are much happier without all those painful teeth.